You can see from this diagram that there are two more stages we can write custom code for. First we can write a custom lighting model that will allow us to apply light data to the output of our surface program to come up with a pixel value and then there is a final modification where we can just fiddle with the color before it is output to the screen. We’ll start with a basic bump mapped shader and add a few things. To start with, let’s just see how to use that finalcolor function so we can reduce the number of colours coming out of our texture. First we add the optional finalcolor program marker to our #pragma directive telling it we want to write a function call final. Then we add a _Tooniness property with a range of 0.1 to 20 and a default value of 4 – we will use this to decide how many colours we will limit our texture to. Of course as we’ve defined a property we also need to add a variable with exactly the same name. We simple fix the range of the color by multipling it (remember it’s rgba) by our tooniness, removing any floating point values and then dividing it back down again. That’s it, not the best effect in the world but it will do for a start! Adjusting the tooniness will change how resolved the colours are. 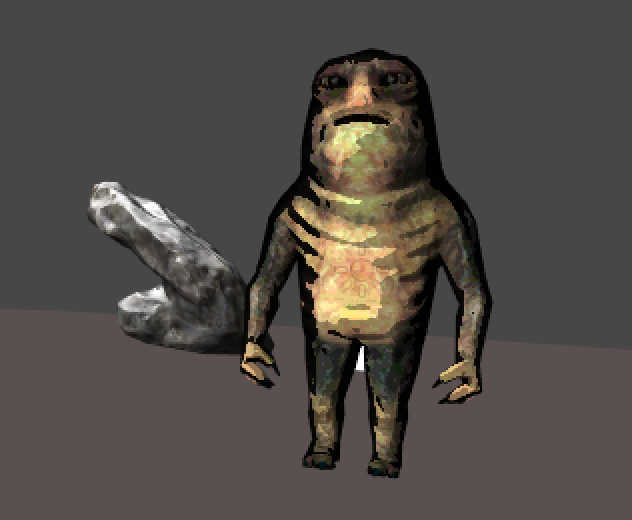 It’s sort of a useful effect, because most of the time toon shading works best on models with low numbers of colours. But it’s not really a toon shader yet. However at least we now know how to make a final modification to the colors. Ok so lets resolve to actually do some toon lighting, where the lights on things have sharp edges rather than smooth gradients. To do that we are going to write a custom lighting program. At this stage it’s worth adding another variable. 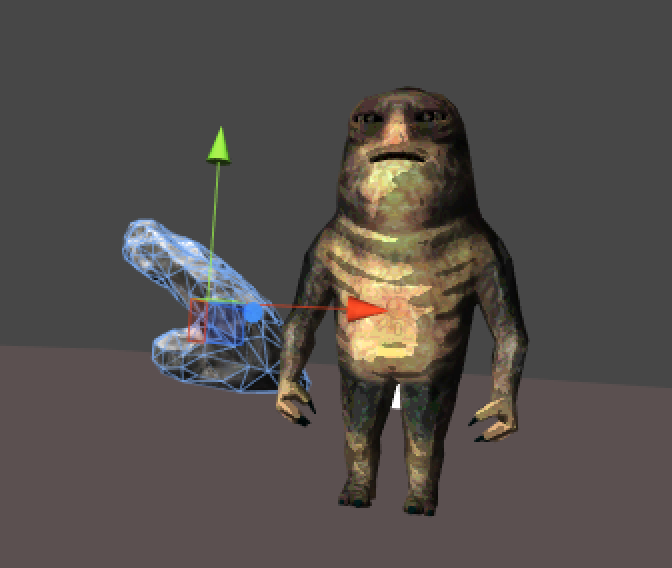 As the current code doesn’t really make it that cartoony, we should add another property called _ColorMerge that will deal with that element and we’ll have _Tooniness handle the lighting – far more reasonable! Right so now we want to add a lighting program. This is another of those coding by convention times in shader programming. Rather than Lambert lighting we’ve been using up to now, we replace it with Toon. 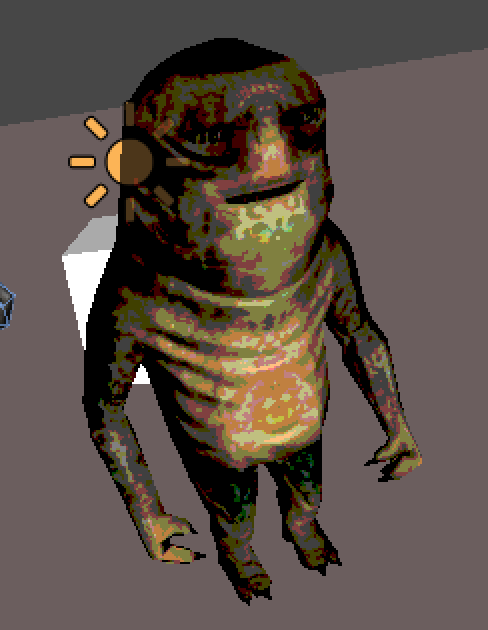 Note that we’ve removed the final color function – in a moment you’ll see I’ve put it in the surface shader, which is better when it comes to this lighting (we get more variety and it still looks toony). Have said we want to use Toon lighting we have to write a function called LightingToon – in other words prepend Lighting to the name of the model you use in the #pragma. Lighting functions always take three parameters – the output from our surface program, the direction of the light and the attenuation to use. They always return the color of the lit pixel. 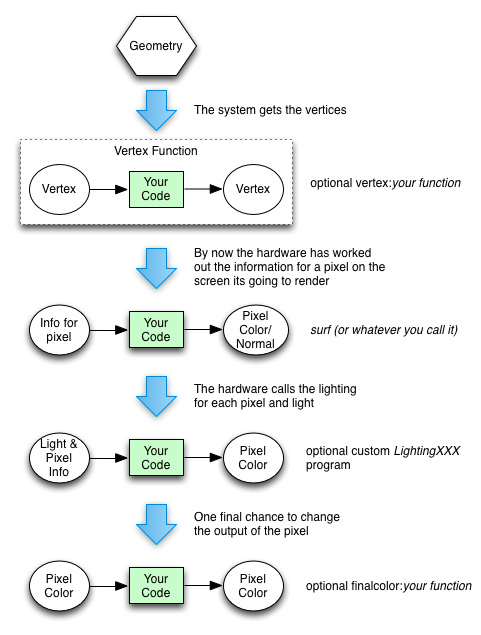 So this is how lighting works – we take the light direction and the normal of the pixel and produce the dot product. Remember that the dot product is 1 if the two items are facing each other -1 if the are exactly opposite and 0 at the 90 degree point. That’s very helpful for lighting of course – a pixel directly facing the light will get its full colour. Anything beyond 90 degrees will become black and unlit and there will be an interpolation in between. Remember Unity is summing this for each light and will automagically add the ambient light and intensity to the pixel we returned from surface – in here we want to say a pixel is black if it isn’t affected by the current light. 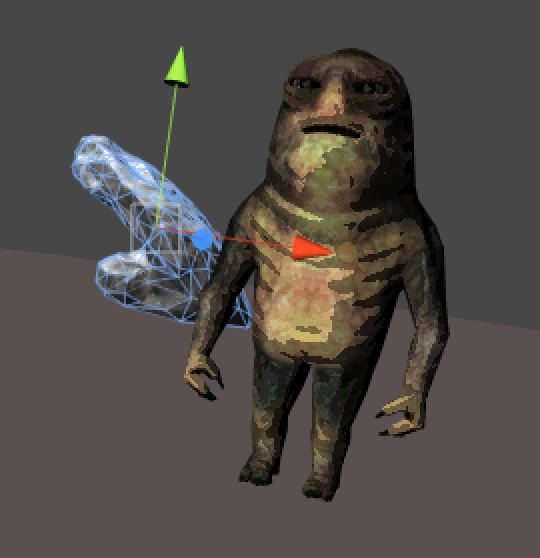 For our Toon shading we add a very similar function to the one we had for the colour merging. Basically we take a lovely smooth interpolated value that would be applied to the colour of the pixel and then make it have distinct steps by multiplying it by the tooniness, removing the fractional part and dividing it out again. In other words there will be sharply defined areas of lightness. Ok so the problem with these sudden changes is that as the model rotates pixels may shift quickly from light to the next step darker and perhaps back again. We really want to smooth the transitions. To do that the best idea is to create something that will make that smoothing for us – we could try to write a function – but the easiest way turns out to be a thing called a ramp texture. The ramp texture lets us turn our lovely smooth NdotL (normal of the pixel, dot product with the light direction) into a range of steps with slight smoothing between them. And the great news is we can just use a simple sampler2D to convert our normal onto the texture! We can use this technique because the UVs of the texture will be between 0..1 so we plug in the u as the value of NdotL and make v halfway down the texture and we’re done. We now modify NdotL by saturating (clamping between 0..1 remember) the texture lookup from the ramp texture. Otherwise it’s exactly the same. Rim lighting looks for the pixels which are nearly 90 degrees away from the view direction and, in this case, turns them to black. You’ve probably guessed that the dot product is going to come in handy here – but we also need to know about the direction the camera is facing, because we want this black edge to be relative to that. Now all we have to do is detect the edge in the surf function. First we work out the dot product to the edge by taking the normal of the pixel and the view direction. Then if it’s less than our property cut off value (remember 0 means 90 degrees from the view direction) we make it a small number (a divide by 4 seems to work well), if it’s above that then we make it simply a 1 (no effect). We just multiply that value into our colour and away we go.